Plans are to certify the Kestrel first with a six-seat executive club interior, but it will be easily reconfigurable for other missions such as high-density commuter, combi and air ambulance. The old federal building in Superior, Wis., dates back to 1908. The ornate masonry structure features high ceilings, marble floors and trim, stately woodwork and fixtures, enormous walk-in safes and vaults and massive open spaces. It was being redeveloped for private use when it caught Alan Klapmeier’s eye. This is where Klapmeier decided to set up shop as he and his team work to redesign and launch the Kestrel single-engine turboprop. The Kestrel first flew in 2006 when the company was called Farnborough Aircraft. Following bankruptcy reorganization, the company attracted several new investors, and in 2010 Klapmeier, the former Cirrus Design CEO, joined the company as CEO and president. Since then, Klapmeier has built his company with funds from a variety of private and public sources and assembled a core team of engineers in Superior and Brunswick, Maine, where the company maintains composite operations and recently acquired a small tooling company. Kestrel currently employs 100 between both locations. Plans to branch into the aircraft modification business in Brunswick are still being developed, and the original Kestrel prototype has undergone a major redesign, with a revised loft and wing, bigger cockpit and cabin as well as Garmin G3000 touchscreen avionics and Honeywell’s 1,650-shp TPE331-14GR engine and a new engine inlet. Other vendor selection announcements are nearing, including the supplier of the aircraft’s raw composite material, dual-zone environmental control systems, adhesives, transparencies and landing gear. Some changes were made to enhance the aircraft’s ergonomics and performance, while others, such as dropping the elliptical wing in favor of a straight taper, resulted in changes to the sweep and dihedral of both the main wing and the horizontal stabilizer and improved manufacturability. 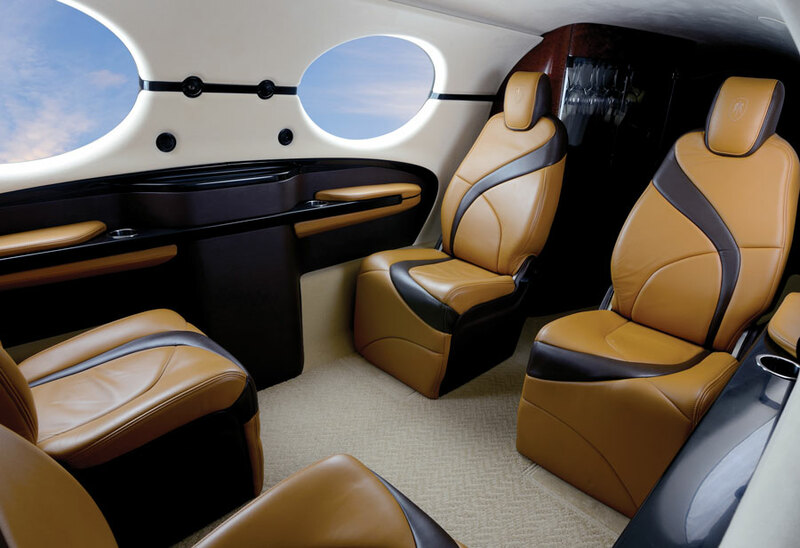 Initial performance targets include a 320-plus-knot cruise speed, a tanks-full range of 1,300 nm with 1,250 pounds of payload and a price on par with or below that of a Daher-Socata TBM 850. Kestrel vice president Steve Serfling said the development program had made good progress over the last year with regard to vendor selection, major component testing and validation of construction techniques for the all-composite aircraft. This includes the ability to manufacture a single-piece fuselage. Initial meetings with the FAA, including a preliminary type certificate board meeting in March, also have gone well, he said. At this point, the concepts are frozen while detail design work on the systems and structures continue, with some nearing release by year’s end. Now it’s just a question of money. Just as he did at Cirrus, Klapmeier spends most of his time at Kestrel raising funds to continue aircraft development. In July, he said the program needed an additional $125 million to see it through certification and hopes to start assembling a prototype aircraft next year. If that happens, certification could come as early as 2016; however, Klapmeier has learned not to make predictions about timelines. When AIN visited Kestrel in August, Klapmeier was out of the office hunting up investors. However, staff continued work there on the Kestrel design. Engineering director Michael Hinton and Ron Blum, manager of engineering flight test, have been deeply involved in the aircraft’s redesign and discussed those changes as well as program milestones and the program’s progress. Until the prototype is ready to fly, Blum is spending most of his time concentrating on the man-machine cockpit interface and systems viability, and that has been a big help to engineering, Hinton said. “Having flight test involved early [in the design process] strengthens the connection between the paper and physical airplane,” he said. He also noted that a flight-test program takes time to develop and must be ready well in advance of an aircraft’s first flight. The Kestrel will be available with a variety of interiors including a six-seat executive club, high-density commuter, combi and air ambulance. Hinton said the plan is to first certify the airplane with the executive interior, perhaps with a seventh-seat option, but that the cabin is designed to be easily reconfigurable for different missions. Other options such as an air-ambulance will be kitted post-certification, and Hinton said the company is already working with suppliers to determine their needs and design the aircraft with the features and structures required for these installations. The wealth of local composite expertise is the main reason not to consolidate the Brunswick operation into Superior, Hinton said, and a small number of composite parts for production aircraft will be fabricated there. However, most of the manufacturing will take place in Superior in two facilities–a main manufacturing plant in town and then trucking those parts for final assembly and bonding facility six miles away at another building at the Superior airport. The trucking logistics already have Kestrel and Superior officials looking at possibly repositioning some traffic signals. The Kestrel features a single power lever, eliminating the control for propeller pitch. It is not a full-authority digital engine control (Fadec), but rather an IEC, or integrated electronic control. “It’s a computer that says, ‘Here’s your redline, don’t go past this,’” Blum said. “But you are still setting power manually through a hydromechanical controller. You set the power by looking at the torque meter.” However, the throttle quadrant will still contain a “hi-lo” condition lever. Flight control linkages from the cockpit side sticks also are all mechanical. Airframe de-icing will be provided by an electromechanical expulsive de-ice system. The propeller and windshield will have electric heat. Of all the changes made to the original Farnborough design, Blum thinks the addition of the Honeywell engine is the most significant. “It has a 5,000-hour TBO and it does not have the inertial separator like the PT-6 has, so we gain the efficiency in the inlet. It is proven that it can eat anything.” On the Kestrel, “eductor” nozzles pull air through the cowling thereby cooling the exhaust stacks and the engine compartment any time the engine is running, while also adding some residual thrust. The engine, 110-inch diameter Hartzell composite propeller and Kestrel cowling have been running on a test stand at Honeywell since spring. “We’ve done a good job reducing the noise signature” with some acoustical treatments, said Blum. Hinton added that the noise signature on the Dash 14 engine is inherently less than on the smaller versions of the TPE series engines aboard the Mitsubishi MU-2. Kestrel also intends to build some components that most other manufacturers subcontract, including the seat structure. “We have two great seat designers in house and the seats are going to be fantastic,” Blum said. Some systems, such as the environmental control system layout, are being tested on a static engineering mockup. Wing and fuselage manufacturing are also going through layup trials.